Among the 70+ aircraft set to take part in the aerial portion of this year's parade is a pair of Sukhoi Su-57 stealth fighter jets, which will be making their parade debut. The stealth air superiority fighter, presently in the final stage of pre-production flight-testing, has undergone combat trials in Syria. Packed with state-of-the-art avionics and an active airborne phased array radar, the supermaneuverable aircraft can be fitted for a variety of air-to-ground and air-to-air missiles, including cutting-edge systems developed specifically for the fifth-gen plane. In addition to its internal weapons compartments for stealth mode, the Su-57 has with six external hard points, theoretically allowing it to carry the BrahMos anti-ship and land-attack cruise missile. Also making its premier at this year's parade is the Kinzhal ('Dagger'), a hypersonic missile designed to be able to penetrate all existing and prospective enemy air defenses. Carried by the MiG-31 supersonic interceptor fighter, the Kinzhal has a range of over 2,000 km, flies at Mach 10, and is capable of maneuvering at all stages of flight. The system is nuclear-capable. Russian President Vladimir Putin revealed the existence of the Kinzhal, already delivered into the military, alongside five other strategic weapons designed to preserve the global strategic balance, at a speech before lawmakers in early March. MiG-31s fitted with Kinzhals rehearsing for the Victory Day Parade outside Moscow. 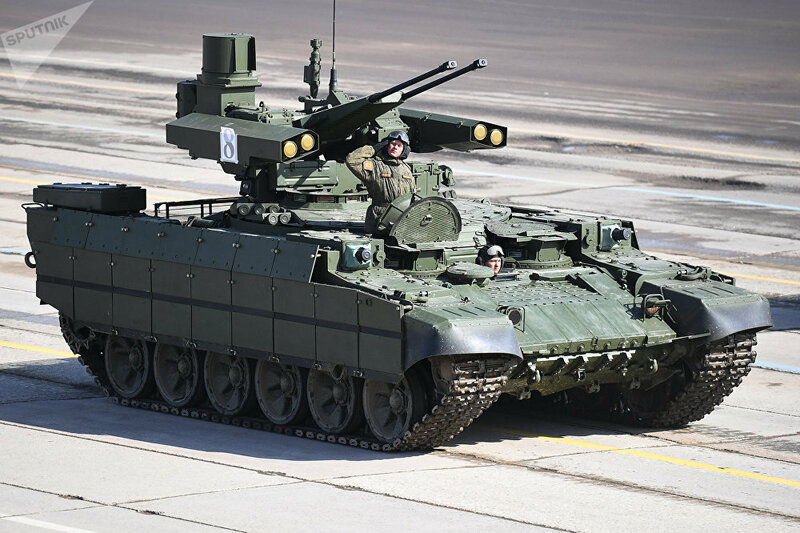 Also making its debut on Red Square this year is the BMPT Terminator, an armored fighting vehicle designed and produced by Uralvagonzavod, the Nizhny Tagil-based armor manufacturer best known for its main battle tanks. On its MBT chassis are four Ataka anti-tank missile launchers, two 30 mm autocannons, two grenade launchers, and a coaxial 7.62 machinegun. Like much of the new equipment in this list, the Terminator has seen testing in the campaign against the jihadists in Syria. 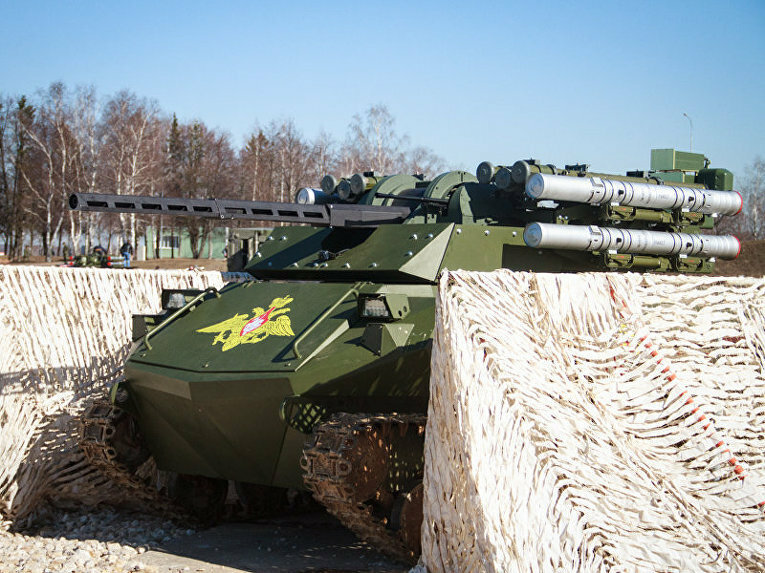 This year's parade will also see the debut of a whopping four new unmanned combat systems – the Uran-6 and Uran-9 unmanned demining and combat vehicles, and the Korsar and Katran unmanned aerial vehicles. The Uran-9 is developed and produced by JSC 766 UPTK, a Moscow-region company specializing in high-tech military equipment. The robotic combat system is designed to conduct reconnaissance and fire support for recon units and frontline combined-arms formations. Controlled remotely from a mobile command point, the Uran-9's purpose is to increase combat effectiveness while reducing personnel losses, particularly in urban combat environments. The tankette, which has undergone testing in Syria together with its Uran-6 mine-clearing robot cousin, is capable of attacking enemy armor, personnel and hard points with its complement of anti-tank missiles, rapid-fire cannons or even flamethrower weaponry. Joining the ground-based robotic systems is the Korsar UAV, a round-the-clock, all-weather drone designed for surveillance, real-time target acquisition, battle damage assessment and the delivery of light cargoes to ground forces. 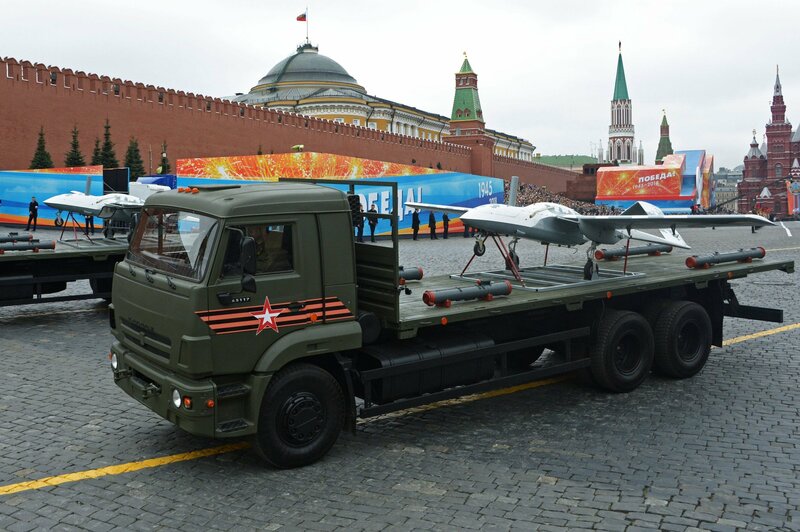 A tactical level drone, the Korsar is capable of operating up to 100 km from its command center. Like the tankettes, this UAV, whose development has long been shrouded in secrecy, has been baptized by fire in Syria. Rounding out the new robotic equipment is the Katran, a helicopter drone with unparalleled thrust, flight time and payload characteristics in its class. The all-weather device can carry a variety of equipment, allowing it to serve as a reconnaissance or electronic warfare platform, or carry out strikes using both guided and unguided munitions. The maneuverable drone can ascend to a height of up to two km, and zoom along at 130 km per hour. The Katran has a useful payload capacity of 120 kilograms. While the above systems will surely take all the glory, other debuting cutting edge systems to watch out for at the 2018 Victory Day parade include the Tor-M2 surface-to-air missile system, Patrul MRAP vehicles, Ural-432009 6x6 trucks, and GAZ Tigr infantry mobility vehicles in the National Guard color scheme.